If breadcrumbs are prepared use 3 ¼ cup per 50 servings. If breadcrumbs have not been prepared, cut hamburger buns in half and toast on a low temperature oven (200 degrees F) until slightly golden brown and firm (see recipe MRS 1303 for detailed directions and pictures). Break bread into pieces and place in food processor or appropriate grinder. Process bread until desired crumb size is obtained. Rehydrate potatoes according to package instructions or cover potatoes with hot tap water. Let stand for 5 minutes then drain well. 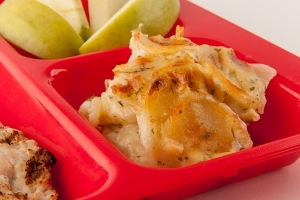 Place 2 pounds 10 ounces (3 quart) potatoes into each steamtable pan (12" x 20" x 2 ½") coated with pan release spray. For 50 servings, use 2 steamtable pans. Add onions and cook over medium heat for 5 to 10 minutes. Blend flour into margarine and onions. Cook over medium heat, stirring constantly until golden brown, 6 to 8 minutes. Prepare dry milk according to instructions on package. Slowly stir in milk, salt, pepper, and diced parsley flakes. Blend well and cook over medium heat, stirring frequently until slightly thickened or for about 10 to 15 minutes. Pour 3 quarts of liquid mixture over potatoes in each pan. Stir to combine. Combine margarine and bread crumbs. Mix to coat crumbs well. 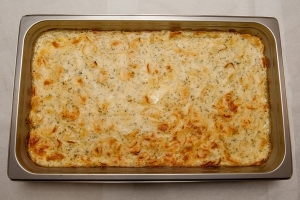 Sprinkle crumbs evenly over each pan, approximately 8 ounces (1 2/3 cup) per pan. Conventional Oven: 350 degrees F for 45 to 60 minutes. Convection Oven: 300 degrees F for 35 to 45 minutes.